Did you know? It would not be uncommon if you visited a garden in Spain to see olives and grapes put out for visiting birds to eat. In the northern states of America bird lovers will often remove the seeds from a cone flower and sprinkle these on a bird table while in southern states like Florida a popular favourite for many backyard birds is summer suet cakes made in the kitchen using lard and peanut butter! Then again, visit South America and The Rain Forests in Brazil and you will see birds feeding on the wide selection of fruit available. 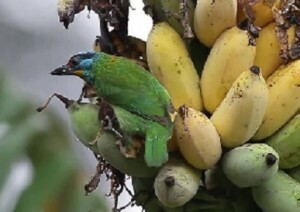 Like in Britain here you will see some birds eating berries and other birds feasting on bananas, papaya and oranges! Looking to create exciting new recipes for your garden visitors? Then visit each week the International Bird Kitchen to find new recipes from around the globe! March Week 4 Juice Blast! March Week 3 Berries, Berries, Berries!